Finishing at the mouth of Baga creek, Baga is a bustling beach resort with a long stretch of golden sand, backed by an unbroken line of makeshift beach shacks. 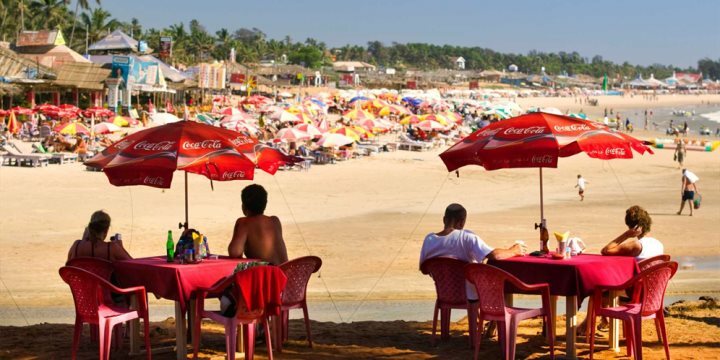 A very popular resort with both international and Indian domestic tourists, it is one of Goa’s most crowded resorts and not for those wishing to escape from it all. It’s no wonder why Baga is one of the most popular resorts in Goa with its striking beachfront location - you can choose to relax on the warm golden sand, partake in an array of water sports, or if you prefer to take a wander up to Baga creek passing colourful fishing boats and local shacks. Baga beach has also been voted twelth in the top 25 beaches in India, in TripAdvisor's 2016 Travellers' Choice awards. The resort is home to Goa’s most renowned nightclub – Tito’s. Set up in 1971 by Tito Henry D’Souza as a place for expats to meet, the brand has grown two fold into a series of clubs, restaurants and bars that are the place to be and be seen. For those wishing to witness Goan nightlife at its best, Tito’s is an experience not to be missed. Please find below a selection of our accommodation in the resort of Baga in North Goa.